ANTHONY Davis is playing again for the Pelicans, but not everyone is happy about it. In his first game since suffering a finger injury and then being benched following a pre-NBA trade deadline request to be moved, Davis returned to the court in New Orleans on Friday (local time) amid boos from the home crowd. The All-Star first heard the boos when he was introduced ahead of tip-off, and then again when he got his first touch of the game against the Timberwolves - though he did receive some cheers after throwing down a dunk for his first points. It was not an unexpected reaction from fans, who watched Davis ask to be dealt ahead while claiming he would be testing the free agent market in 2020 no matter what. The request led to the Pelicans keeping him out of the line-up to protect his value, an idea that was floated to continue after the deadline. The NBA caught on and reportedly threatened to fine the team $100,000 for every game a healthy Davis sat on the sidelines. So now, Davis is playing - he put up 24 points in the first half - though it seems like all parties are destined to be really conflicted about it. It has set up the bizarre scenario where both the Pelicans and Davis will be forced to go through the motions of suiting up for every match, while both parties remain very clear the bigger picture is that Davis must remain healthy for the end-of-season trade period. 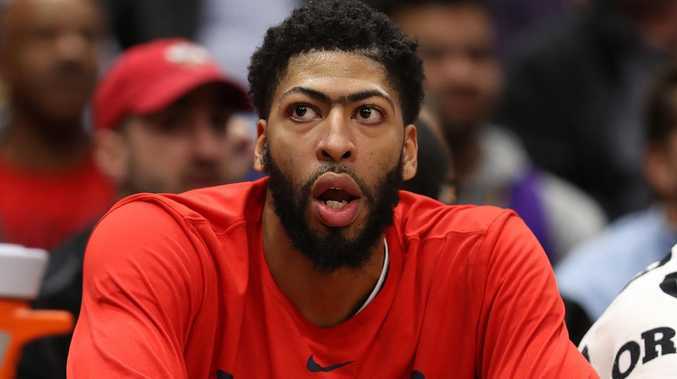 Leading the commentary surrounding the bizarre situation was senior ESPN analyst Jeff Van Gundy, who thrashed the league for putting Davis and the Pelicans in this position. He implored Pelicans owner Gayle Benson to stick it to the league by forcing officials to deliver on their reported threat to fine the team $100,000 every time Davis was rested without proper cause. He even suggested the NBA had ulterior motives in its enforcement of the rules, hoping to see a superstar such as Davis move to the bigger market in Los Angeles. "The NBA is trying to bully her and threaten her with unduly harsh fines and if I was her, I would pay the fine," he said. "At the end of the day I'm going to do what's best for my franchise. I'm not going to put him out there at risk for injury and reduce my lottery chances or my trade opportunities. I think the league is wrong. New Orleans has to be allowed to do exactly what is best for them." The Pelicans held on to Davis at the NBA trade deadline, but dealt Nikola Mirotic to the Bucks, one of the Eastern Conference contenders who fortified their teams on Thursday before the NBA trade deadline. A busy swap season that included Dallas's acquisition of Kristaps Porzingis from New York ended without a move for Davis, the player who dominated the discussion in recent weeks. The Pelicans didn't find a deal for Davis, who had requested a trade and informed the team he wouldn't sign a contract extension this summer. But the Lakers couldn't put together a strong enough package to the Pelicans' liking for the All-Star forward, who will go back into the trade market after the season ends. There will be other marquee names available then, in a free-agent class that could be highlighted by players such as Kevin Durant, Kyrie Irving and Kawhi Leonard.